Chris and I invited the other interns over for a fondue and games party tonight. We had 8 adults all together, and 5 kids: Dustin and Sara Smith along with their 3 kids, Julie Cabrera (oh how we missed Orlando who had to work), Patrick and Courtney Walton, Remi Lai, and of course Chris and I. We had a great time! The kids played in the play room together (the castle jumper was a big hit!) 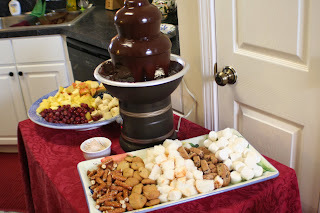 and the adults gathered around my fondue fountain for a good portion of the night. 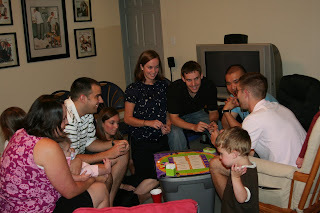 After we moved to the family room, we talked for a while and pulled out the game, Moods, which is one of our favorites! We all had a great time playing, laughing and talking together. We've certainly been blessed to have several other families as part of the residency who have faith in Christ and strong family values. We're enjoying them immensely and look forward to many more get-togethers! Thanks so much for having us over tonight! I know Orlando missed being there...though I had a great time with all of you :) Both you and Chris have been so great welcoming all of us into your home. We are on our way to getting situated over here VERY soon so we will definitely return the favor! Have a wonderful weekend! Looks yummy! I'm so glad to see/hear that you guys are getting to know the other interns. We also had our group over tonight for dinner. haha no, my computer must be set on pacific time! But, it was around 6am :) which is still too early for a Saturday morning! We had a ton of fun last night, and really loved playing MOODS! !